A term loosely based on the concept of “Writer’s block”. A condition, in which an artist experiences a creative slowdown or performance crisis. Often perpetuated by the feeling or sense that progress and inspiration are somehow impeded by an unseen or unknown barrier. Creative blocks are disruptive by definition and crippling in nature. And unfortunately, they’re also an all too common occurrence for many creatives. If you’re looking to avoid these momentum killing bouts of creative paralysis the most important thing you can do is to just keep moving. I realize that sounds obvious, cliche, even. But it’s something that many of us all too often forget and worth a reminder. This is especially true if you are an emerging artist, an up-and-coming photographer or really anyone in the process of turning their creative passions into a creative career – for the simple fact that at those early stages losing your momentum can be absolutely devastating. My advice? Do not stop to think about what you’re making. Don’t worry about finding your voice or having a unique vision. And, absolutely never put an idea off because of a lack of resources. Instead, focus on overcoming your immediate production hurdles by any means necessary. Find a way to get the project done and do it well. Don’t stop to critique. Instead, move and critique, critique and move. That is the true nature of the creative process. Your voice, your uniqueness, your style, your personal story, even your artist’s statement – all of these things will come. They are not something that is predefined in a vacuum. Rather, these things are the fingerprints of the creative process and an organic byproduct of the practical decisions you make on a day-to-day basis to move beyond production hurdles. Have faith in the process. Things can and will turn in an unexpected and positive direction. But only if you are prolific, willing to fail quickly and remain open to inspiration when it strikes, regardless of when it strikes in the production process. It should go without saying, always stay within your budget and never miss a deadline. But beyond that, don’t be afraid to pivot mid-project or walk away from sunk costs. If you see a better path to your destination, one that will result in a finer end product – take that path. My most celebrated series, almost never happened. Seriously. If someone told me a year ago that my dog photographer portfolio would soon revolve mostly around whimsical portraits of dogs wearing hats I would have laughed at you. On its face, Paper Hats is an absurd premise. Frankly, if our process was dependent on brainstorming, the series never would have come to fruition. 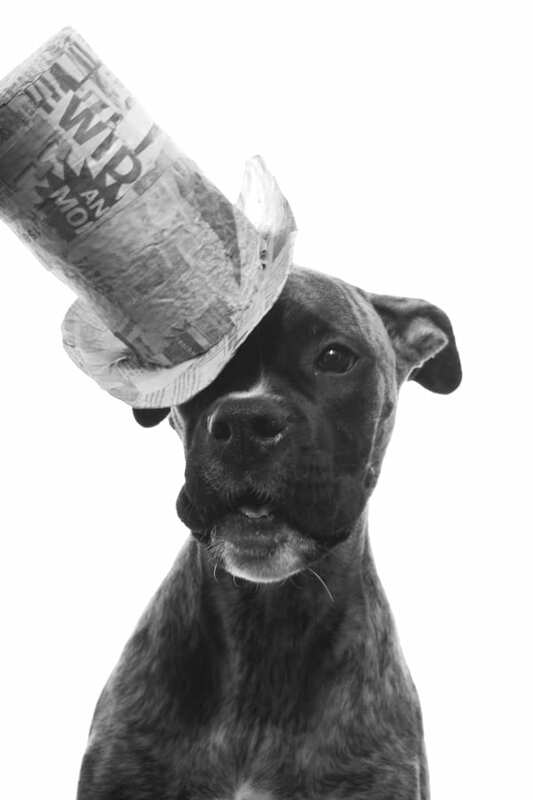 But Paper Hats has been easily our most successful dog portrait series to date. One that has led to multiple sold-out art shows and resulted directly in both new private dog portrait commissions, commercial pet product photography assignments, a number of fun licensing opportunities, and helped establish me as one of the most most celebrated dog photographers in Washington D.C. and Baltimore. So, how did a conceptual theme that had no business moving beyond the whiteboard come to be? In the words of the immortal Bob Ross, Paper Hats was a happy accident. Inspiration can strike at any time. Be ready for it. Many of our fans and clients don’t realize this, but Paper Hats wasn’t originally conceived as its own style of dog portrait. In fact, our original concept was much much different. 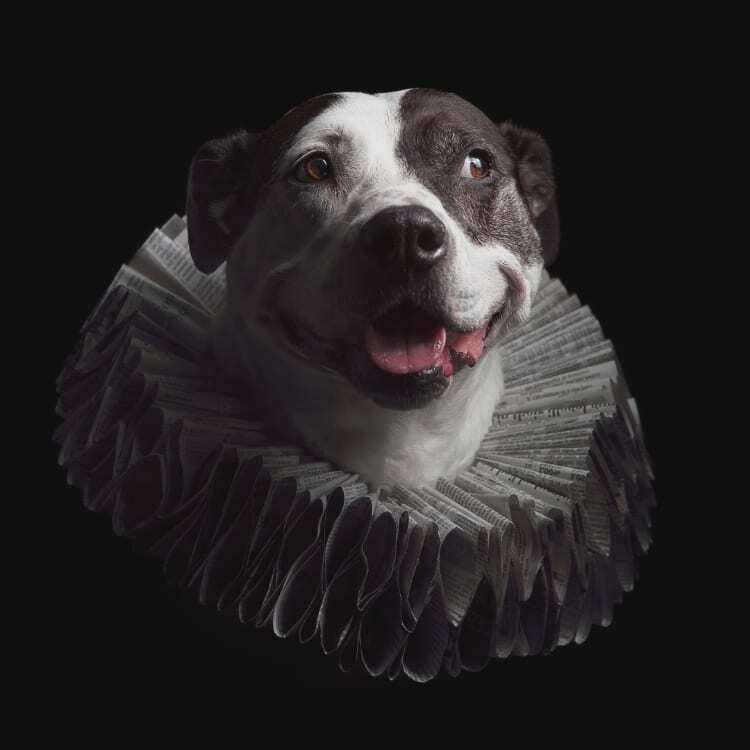 We had initially realized it as a historically inspired pet portrait series, borrowing from and informed by Elizabethan and Victorian period formal dress. No joke. Prior to creating our first paper hat, we had already created a series of headdresses, hats, dresses, tunics, coats and Baroque style ruff collars for dogs – all made from fine velvet, silk and lace textiles. With the help of my wife, Alyssa, and mother-and-law, Beth of B Freed Creations, we had spent countless hours combing thrift shops for fabric (mostly old curtains, ornate tablecloths and textile samples), planning, designing and of course, sewing. We had invested a significant amount of time to get the costumes for the series ready for production. All that was left to finish the set was to sew the ruff collars. We even had the fabric ready to go. 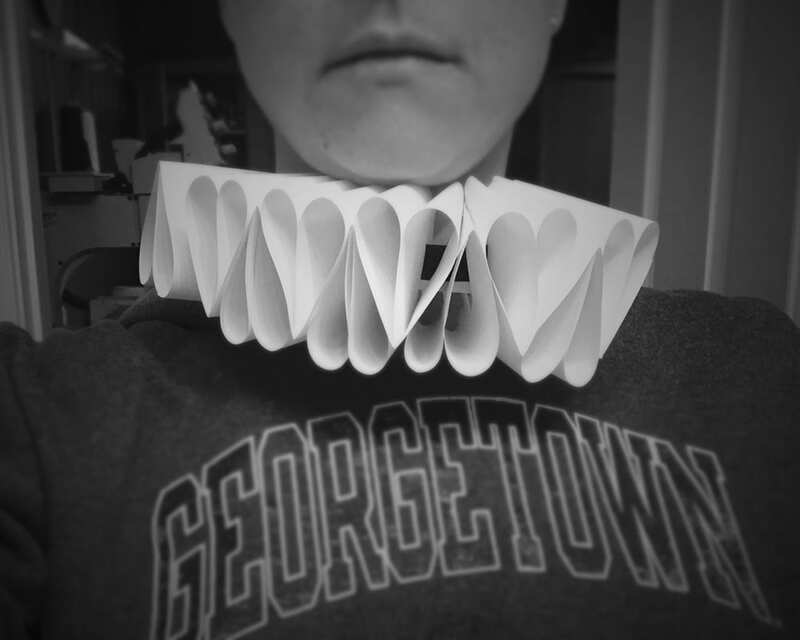 But in consideration of the expense of the materials and complexity of the build, we decided to use paper, a far more affordable and forgiving material, to build the initial prototype for the ruff collar. Fail often. Fail quickly. Keep your eyes open. From that first prototype, we recognized almost immediately that we were on to something larger thematically. Just seeing it, even partially constructed, was enough to bridge the concept together. Because while dressing street dogs in period costumes and finery was unexpected and amusing, dressing rescued dogs in costumes made from rescued and recycled materials told a better story and was more socially conscious. 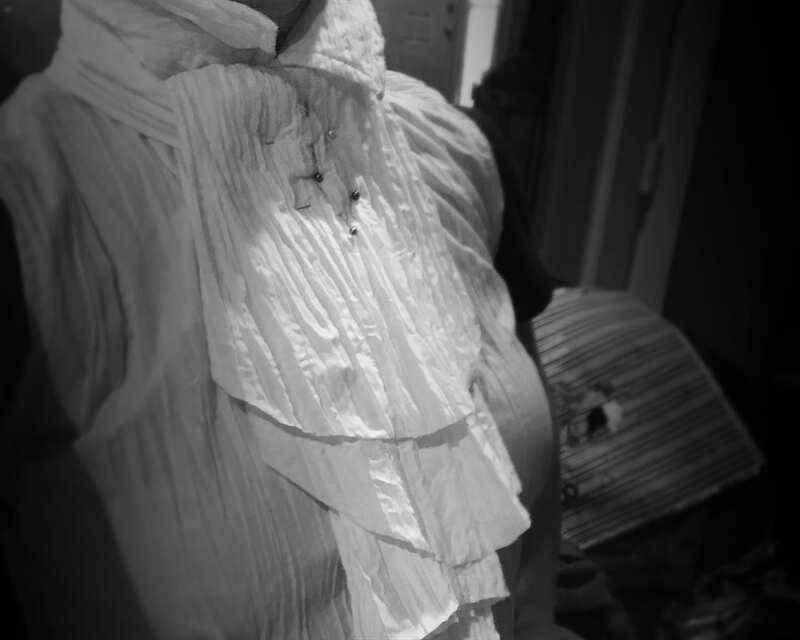 While our initial collar was constructed using plain white paper, it didn’t take much of a leap to envision the collar wrapped in randomly interrupted print, a textured pattern that would lend for far more visually striking imagery. At that point and time, we had three shoots already on the books scheduled for the following week, we were roughly three months out from the initial show opening and we already had 90% of our costumes completed and ready to photograph. So, we did what any reasonable person would do. We scrapped everything. Immediately setting to work designing an entirely new series of costumes from newspaper, paper plates, cardboard and other post-consumer sourced paper products. Needless to say, it was a struggle to get things done in time. In fact, our timeline was so compressed, that during our first few photo dog portrait sessions the hats were still moist to the touch. But at the end of the day, we made it work and our gamble paid off in a big way. Leaving us with one of the most creative types of dog portraits we’ve ever had the pleasure of capturing. It’s impossible to say whether we’ll still be making Paper Hats a year from now or working on something entirely different by then. But what won’t change is the underlying philosophy that drove us to the Paper Hats concept. Which is, of course, is “keep moving and keep making”. If you’re a struggling with a creative block, I hope this story inspires you to push through to your next creation. Thinking of hiring a pet photographer? Commissioning a pet portrait can be complicated – but it doesn’t have to be! Know what you’re looking at before starting your research. For advice on how to shop for photos of your favorite pet, visit our help pet portrait buying guides. Learn more about pet photography costs and questions you should ask before hiring a dog photographer.